Get ready to walk the plank towards a world of huge rewarrrrrrrds in glorious 3D! Pirate Isle puts you on an old-time pirate ship in search of all kinds of treasure. 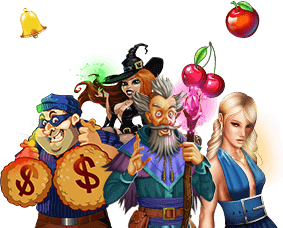 This 25-fixed payline game brings you the chance to win up to 300 free games, just by snagging 5 Treasure Keys. Plus, the jackpot reset of $5,000 means that sailing the high seas could lead to a wave of unexpected rewards. Packed with two feature games, including the Treasure Chest Feature and the Extra Bet Broadside Feature, Pirate Isle offers a new adventure with every spin. The game is available for download right now, plus you can play it through your browser via our Instant Play option. All it takes is a free account to get started, so come play! Pirate Isle is built with cutting edge 3D graphics, and at first things can look a bit complex. But don’t worry, it’s easy to play. Start by making your Bet selections. You can wager as little as $0.25 per spin or as much as $6.25. This game is a 25-fixed payline game, so you can’t adjust the number of lines you want to play. The online slot also features an Extra Bet, which is valued at 20% of your total slot bet. Simply click the Extra Bet Active button to deactivate the bet. It’ll light up as Extra Bet Inactive when the extra bet isn’t being placed. When you’re happy with your bet, click the Spin button to set the reels in motion. You’ll get paid out based on which symbols you’ve managed to line up. And you’ll move to a feature game automatically if applicable. Pirate Isle features the Extra Bet Broadside Feature that lets you get closer to bigger wins and bigger jackpots. When activated, you’ll place an extra bet worth 5x the bet per line. To trigger the feature, just hit 3 or more Galleons. Then, exchange broadsides with an enemy Galleon. When you do, you’ll move up the prize ladder. You’ll get to face new enemies until you face off against 5 opponents or until you’re defeated, whichever comes first. If you manage to make it to the top of the ladder, the Pirate’s Treasure Jackpot is yours. Scatter: There are two scatter symbols in Pirate Isle. Both Galleon and Treasure Chest symbols play the role and any wins with these are added to line wins and multiplied by the bet. Substitute: The Skeleton Key is the substitute symbol and it can sub in for all other symbols in the game, except for Galleons and Treasure Chests. Pirate Ghost: Finding one in the Treasure Chest feature game ends the feature and leads to 100 free spins.